A historic house museum is a house that has been transformed into a museum. Historic furnishings may be displayed in a way that reflects their original placement and usage in a home. Historic house museums are held to a variety of standards, including those of the International Council of Museums. The International Council of Museums defines a museum as: "A museum as a non profit-making, permanent institution in the service of society and of its development, open to the public, which acquires, conserves, researches, communicates and exhibits, for purpose of study, education and enjoyment, the tangible and intangible evidence of people and their environment." Houses are transformed into museums for a number of different reasons. For example, the homes of famous writers are frequently turned into writer's home museums to support literary tourism. 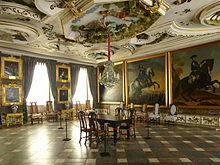 The Kings' Hall at Skokloster in Sweden. Also known as a ‘memory museum’, which is a term used to suggest that historic house museum contains a collection of the traces of memory of the people who once lived there. It is often made up of the inhabitants’ belongings and objects – this approach is mostly concerned with authenticity. Some museums are organised around the person who lived there or the social role the house had. Other historic house museums may be partially or completely reconstructed in order to tell the story of a particular area, social-class or historical period. The ‘narrative’ of the people who lived there guides this approach, and dictates the manner in which it is completed. In each kind of museum visitors learn about the previous inhabitants through an explanation and exploration of Social History. Following this historical movement, the concept of ‘Open Air Museums’ became prominent. These particular types of museums had interpreters in costume re-enact the lives of communities in earlier eras, which would then be performed to modern audiences. They often occupied large wooden architecture buildings or outdoor sites and landscapes, that were true to the era adding to authenticity. Collective memory is sometimes used in the resurrection of historic house museums; however, not all historic house museums use this approach. The notion of Collective Memory originated from philosopher and sociologist Maurice Halbwachs, in ‘La memoire collective’ (‘On Collective Memory’, 1950). This extended thesis examines the role of people and place, and how collective memory is not only associated with the individual but is a shared experience. It also focused on the way individual memory is influenced by social structures, as a way of continuing socialisation by producing memory as collective experience. "Each aspect, each detail, of this place has a meaning intelligent only to members of the group, for each portion of its space corresponds to various and different aspects of the structure and life of their society, at least of what is stable in it." An example of a site that utilizes collective memory is the Hiroshima Peace Memorial Park in Japan. It was restored and is based on the dialectics of memory, however it also has the inclusion of joyous festivals to mask the turmoil. The ‘Hiroshima Traces’ (1999) text takes a look the importance of collective memory and how it is embedded in culture and place. Thus, collective memory does not only reside in a house or building, but it also resonates in outdoor space – particularly when a monumental event has occurred, such as war. "The taming of memory that can be observed in the city’s redevelopment projects reveals local mediations and manifestations of transnational as well as national structural forces." Problematic creation of collective memory occurs within historic house museums when the narrative of non-family members is dismissed, ignored, or completely rejected. Within the Southern United States, Plantation Museums (meaning the homes of former enslavers) constitute a significant portion of the museum community and contribute to the racialized collective memory of the United States. Because museums are responsible for “the building of identity, cultural memory and community,” neglecting to include the narrative of ALL people who lived there is dangerous. While some Plantation museum narratives have changed following an outcry from the public and the academy, “plantation museums reflect, create, and contribute to racialized ways of understanding and organizing the world,” by eliminating and limiting the narrative of the enslaved inhabitants. Documentation and credentials must then be used to support it and thus declare if it is authentic. ^ "Museum Definition- ICOM". icom.museum. Retrieved 1 April 2018. ^ Historic Houses Trust of New York official website. ^ The National Society of The Colonial Dames of America official website. ^ "National Trust". www.nationaltrust.org.au. Retrieved 1 April 2018. ^  The Artist's Studio Museum Network official website.